Christmas factor, despite its name, is not named after the festive season during the month of December. The scientific name is Factor IX and is named after Stephen Christmas, whose blood sample lacking Factor IX lead to a new form of haemophilia being discovered. As a child in the 1950’s Stephen Christmas was diagnosed haemophilia. It was known by then that people suffering from haemophilia were deficient in a protein called Factor VIII. Factor VIII is one of the many proteins that are involved with forming blood clots when one suffers a cut, and a lack of Factor VIII leads to an inability to form blood clots upon injury. However, when doctors tested Stephen Christmas’ blood they found that he had perfectly normal levels of Factor VIII but yet still suffered from haemophilia. It was later discovered that Stephen was lacking a different blood clotting factor, Factor IX, which is also known as Christmas Factor. There is now known to be two different types of haemophilia. Those who are lacking Factor VIII (haemophilia A), and those who are lacking in Factor IX (haemophilia B) accounting for approximately 20 % of people who suffer from haemophilia. Sadly, Stephen Christmas passed away on the 20th December 1993 from HIV/AIDS contracted from a contaminated blood transfusion. Modern treatments for haemophilia are transfusions of the purified forms of the missing factors, and this, in combination with modern screening of blood products greatly reduces the chance of any contaminants. Factor IX is a serine protease and is cleaved into two polypeptide chains to become active. The structure shown here is the activated form termed Factor IXa. In the presence of membrane phospholipids, calcium, and Factor VIII, the activated Factor IXa will cleave the next protein in the blood clotting pathway known as Factor X. Factor IXa consists of four different domains: a Gla domain (red) for binding phospholipids and calcium ions, two EGF-like domains (cyan and magenta) for binding other proteins, and a protease domain (green) which cleaves Factor X. 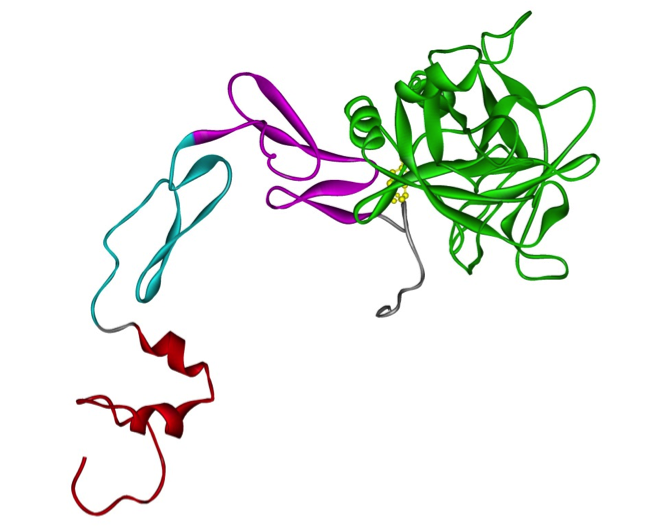 The structure shown here is porcine Factor IXa and was solved by Hans Brandstetter and colleagues in 1995 . 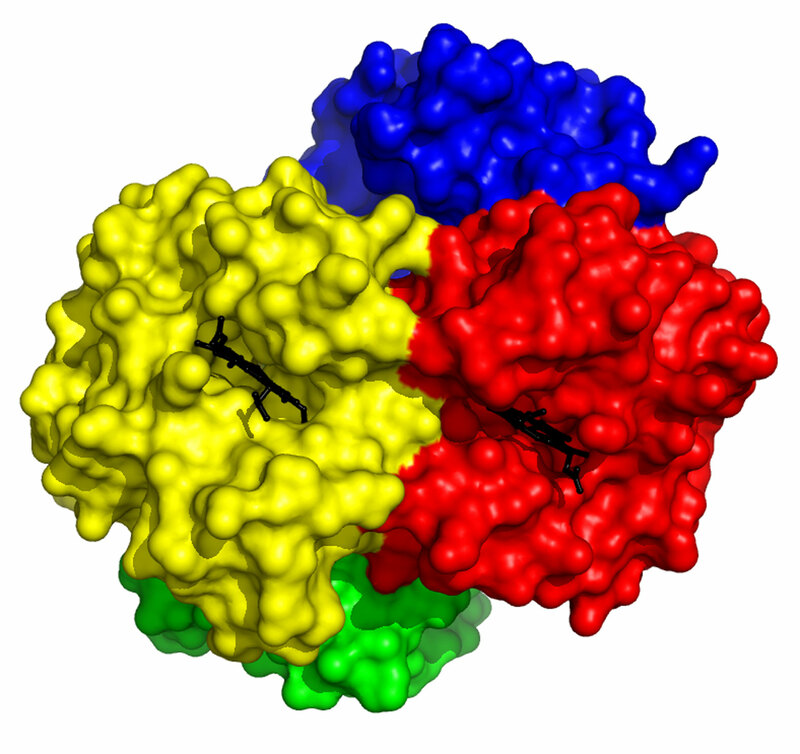 The structure was taken from the Protein Data Bank with PDB code 1PFX. H. Brandstetter, M. Bauer, R. Huber, P. Lollar and W. Bode: X-ray structure of clotting factor IXa: active site and module structure related to Xase activity and hemophilia B. Proc. Natl. Acad. Sci. USA. (1995) 92: 9796-9800. To examine the structure of haemoglobin, Perutz and colleagues isolated the protein from horse blood which is abundant in haemoglobin1; horses typically have a haemoglobin concentration of ~150 g per litre of blood. By comparison in the modern day lab scientists producing recombinant protein ( via a process of co-opting bacteria or other cells to produce large amounts of proteins that they don’t normally produce) usually have to work very hard, growing tens of litres of culture to produce just milligrams (i.e. one thousandth of a gram) of protein for experiments. Hence, in these early days of protein science, horse blood provided a ready source for Perutz and co. to study.